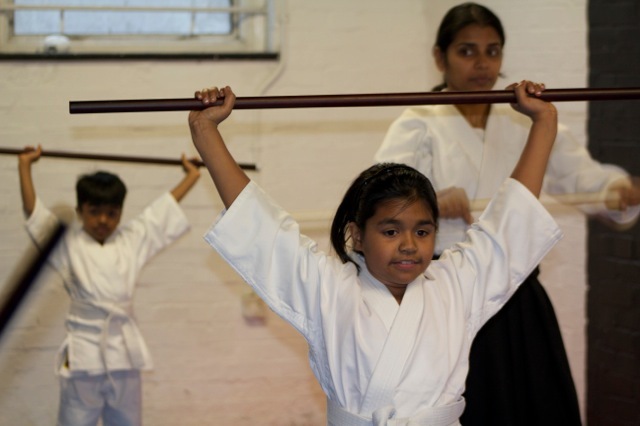 We are teaching a children’s class from 6:00pm-7:00pm on Thursday at our Harrow Dojo. The class will cost £5.00 and will be for children from 5-14 years. Aikido is an ideal martial art for children. Aikido helps children at school. They learn to absorb knowledge more easily, and to think with greater clarity and awareness. By practising in this way, children can’t help but apply this to their daily lives. The children also learn to develop calm, confident and clear minds. Of course, children shouldn’t be calm all the time. But Aikido gives them the choice. If they need to sit still at school, concentrate on homework, or focus during sports, Aikido shows them exactly how to do that. The techniques will teach correct calmness. This is different from keeping their emotions bottled up. Aikido calmness feels good. Aikido does not rely on size, speed or gender. Actually if they use their bodies correctly, it is possible for children to throw adults. There is no competition in Aikido. The children take turns throwing and being thrown. In that way they learn that it is always better to work together. I have been practising AIkido for over twenty years and teaching for over ten. I am a registered coach with the British Aikido Board and am also DRB checked. Our child protection policy can be found on the British Ki Society website. For more information, give me a call on 07973 626518, or use the contact us page.